My twenty-fifth ground of 2017 was on Saturday 16th September at Whaddon Road in Cheltenham, Gloucestershire. 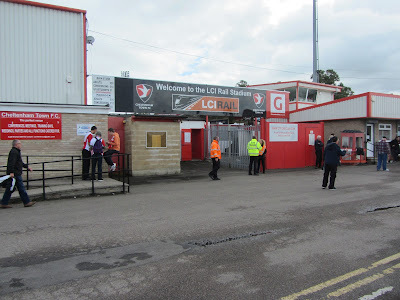 The match was Cheltenham Town vs. Colchester United in Football League Two. 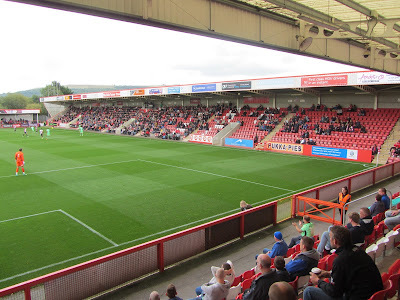 Whaddon Road is in a residential area in the north-east of the town and the stadium complex is bordered by housing on its northern, eastern and western sides. To the south there is a mixture of housing and a bowling green with a recreation ground the other side of the road. Cheltenham Spa railway station is 2 miles south-west of the ground. The venue has been home to the club since 1932. The Main Stand is on the western side of the ground but only runs for around half the length of the pitch. The stand is an all-seater with just under 800 seats split into four seating sections including one for directors and press. The back of the stand has a small number of hospitality boxes and the interior includes the dressing rooms with the players tunnel out the bottom of the structure. Directly in front of the stand are two sections of uncovered concrete terracing which is split by the players tunnel. Towards the southern end there is space for uncovered hard standing as well as food outlets and the club shop facing out towards the car park. In all the western side can accommodate around 1,800 spectators. The Prestbury Road End is a covered concrete terrace behind the northern goal. This takes up the whole of the northern end and has several supporting beams to hold up the roof. There is then an additional area of uncovered concrete terracing which extends round the north-west quadrant before ending level with the penalty spot on the western side of the ground. In total the terracing has room for 2,100 fans. The remainder of the venue are two adjoining all-seater stands opened in the 2000s shortly after the club reached the Football League for the first time. 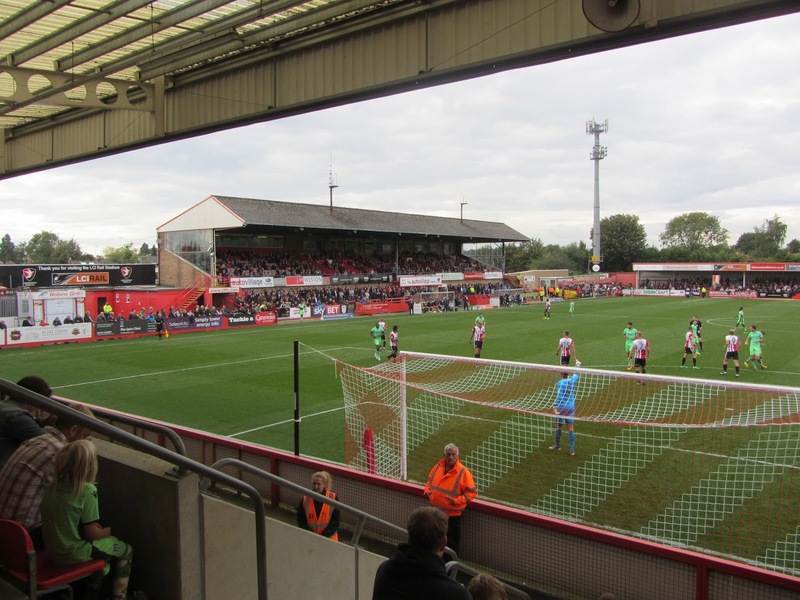 The Wyman's Road Stand runs the length of the eastern side and has a capacity of 2,034. At the back of this stand is a platform for the usual TV camera spot. The south-east corner has a large screen TV which separates the seating from the Whaddon Road Stand which at 1,100 has the smallest capacity in the ground and is given over to away fans. Colchester had a glorious chance to score in the first minute when a wayward backpass put Nicke Kabamba through on goal. Kambamba delayed and delayed and by the time he shot his shot away the chance was gone. This would prove costly for the U's as Cheltenham took the lead shortly after. In the 10th minute Jordan Cranston whipped a cross into the area from the left wing and an unmarked Kevin Dawson headed home from just outside the six-yard box. Five minutes later the hosts went 2-0 up when Dawson's speculative 25-yard shot came off the hip of Mohamed Eisa with the fortunate deflection taking the ball away from Colchester keeper Sam Walker into the bottom corner. The visitors were under pressure but in the 26th minute found a way back into proceedings when they won a penalty after Taylor Moore's handball. Sammie Szmodics went to Scott Flinders's left and found the net. Both sides had decent shots at goal during the rest of the half with Cheltenham's Eisa the closest to finding the back of the net. The key moment came shortly after the break when Colchester's Mikael Mandon deliberately handled in the area resulting in a penalty and a red card for Mandron. Brian Graham's poor spot kick was easily saved by Sam Walker but the respite only lasted for another minute - a free-kick fell to Eisa and he noticed Jack Grimes and Brian Graham unmarked at the back post so squared the ball for them. It was Grimes who got the decisive touch to restore Cheltenham's two-goal advantage. In the final stages the home side took their foot off the gas allowing the visitors to have their best spell of the game - however with the numerical disadvantage they were unable to create much and even when they did Kane Vincent-Young blazed over from six yards out to consign Colchester to another away defeat.